P, phloem; S, stoma; X, xylem. Canopy - a discussion of the woodland canopy with pictures of leaves, leaf venation and stomata. Leaf-litter - the importance of shed leaves in the woodland ecosystem. Transport in Plants - movement of water and nutrients in the plant body. nucleotides, the building blocks of nucleic acids (DNA and RNA). They are less crowded and so avoid competition for light and carbon dioxide. Smaller boundary layers allow leaves to cool more easily through transpiration. Small leaves can be easily moved about to position them for maximum light absorption. Small leaves can be easily vibrated by gentle winds, further reducing boundary layers. will not receive adequate amounts of light for photosynthesis in the centre of the leaf. a certain distance from the surface the fluid will be moving with its free-flowing velocity. it into chemical energy to make food, fuel and chemical building blocks for the plant. can photosynthesise at higher light intensities. The Leaf - Solar Power! converted into chemical bond energy. from the ambient heat energy, since all processes really require energy in one form or another). upon the wavelength of the photon (the wavelength of the photons is what gives light its colour). cell and converted into a more stable and useful form of energy. called a photosystem and is diagrammed below. two different photosystems, photosystem I (PSI) and photosystem II (PSII). absorption spectrum (they absorb photons with different ranges of wavelengths). The chl-a in PSII has an absorption peak at 680 nm and so its reaction centre is called P680. The chl-a in PSI has an absorption peak at 700 nm and so its reaction centre is called P700. Q. What colour would you expect carotenoids to be? yellow, orange or red. 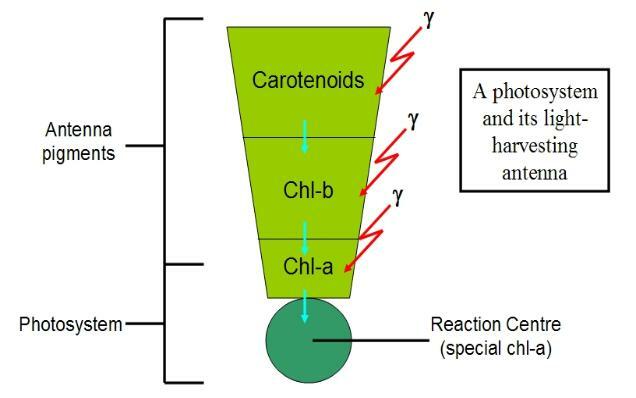 Carotenoids give carrots their orange colour. Q. What gives autumn leaves their characteristic hues? for the colours of autumn leaf fall. Accessory pigments broaden the range of wavelengths that can be used for photosynthesis. have very similar pigment systems to green plants). Q. Which plant organs are photosynthetic? woody plants, but not the older non-green woody parts. Q. Where are the photosystems/chlorophyll located? A. 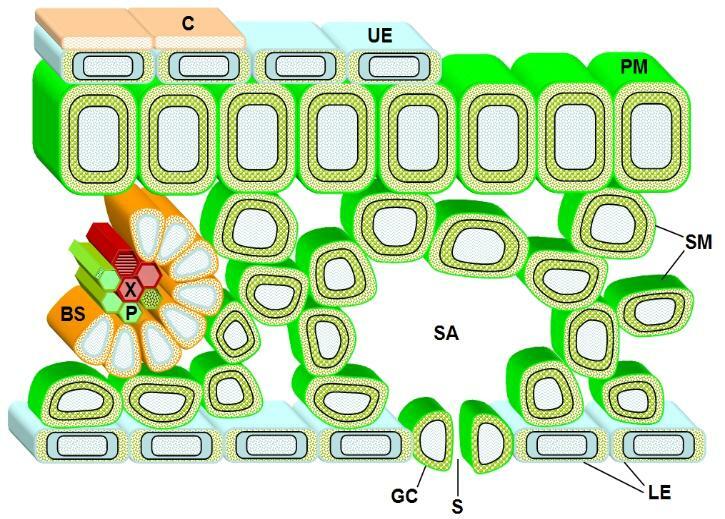 In the thylakoid membranes of the chloroplasts in photosynthetic cells. in PS I has a peak absorption of light at 700 nm and is called P700. Q. The chl-a in the reaction centre of PS II is also called P680, why? A. Because its peak absorption of light is at a wavelength of 680 nm (nanometres). gains an electron it is said to be reduced, and when it loses an electron it is said to oxidised. Q. What happens to the oxygen released from the water? A. Some of it is used by the plant in respiration, the rest passes out through the stomata and into the air. synthesised for every 3 or 4 (probably 4) protons that flow through the ATPase-pore protein complex. Q. How many photons must be absorbed to produce one molecule of O2 by splitting water? Q. 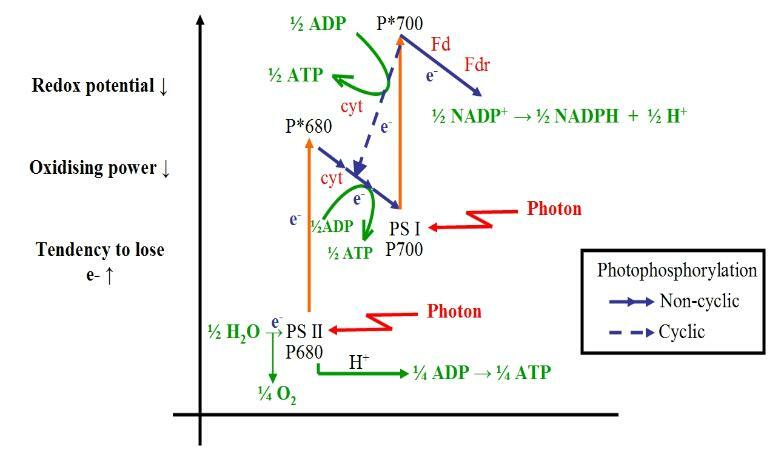 What are the products of non-cyclic photophosphorylation? A. ATP (but no NADPH). The only product of cyclic photophosphorylation is ATP. 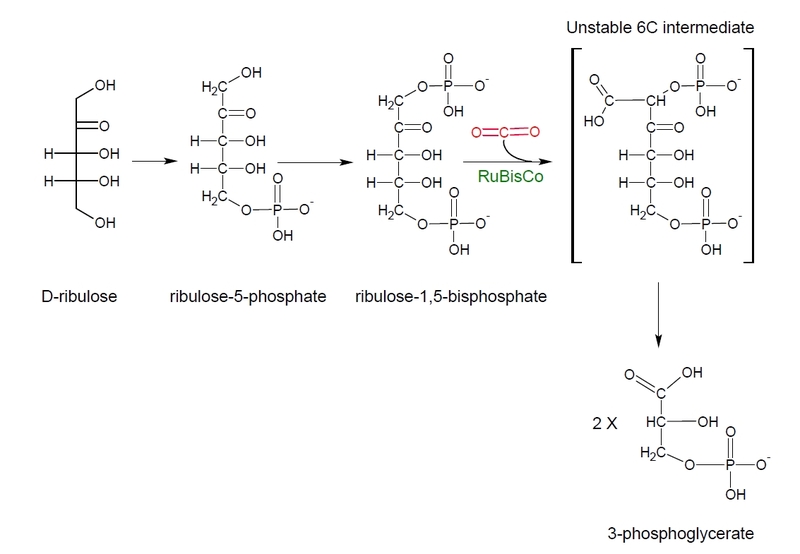 This process is an alternative route to non-cyclic photophosphorylation for electron flow. electron lost by P700 would be replaced by an electron flowing down the ETC from P680 in PSII). 4 protons required to synthesise one molecule of ATP). Sometimes an electron will flow via the cyclic route, sometimes via the non-cyclic route. 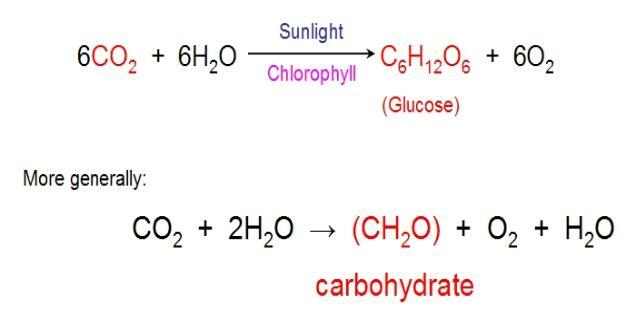 carbon dioxide come into photosynthesis? and the reducing power of the NADH2 to fix carbon dioxide gas into organic carbon. chemical reactions in which the final reaction in the chain links back to the first reaction, forming a circle. 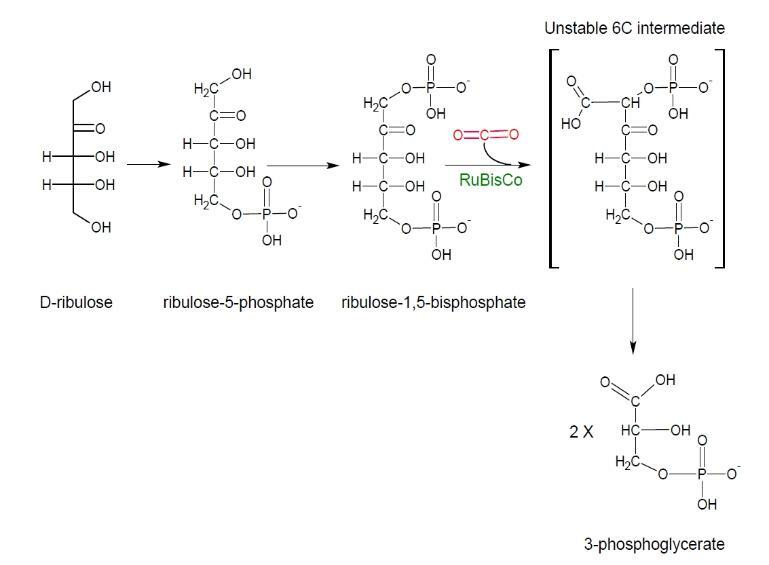 carbon atoms is phosphoryl;ated - a phosphate group is added to it, forming ribulose phosphate. (Fd becomes reduced ferredoxin, Fdr) when it also absorbed a photon to become excited (P*700). step, it gradually loses its power to bring about redox reactions - its redox potential falls. shape (in redox potential space) and do not end where they started. Q. What do you think that ‘cyt’ is an abbreviation for? What does it do? A. 'Cytochrome' - an iron (haem) containing protein that transports electrons in redox reactions. Q. How is the H+ from water is used in ATP production? 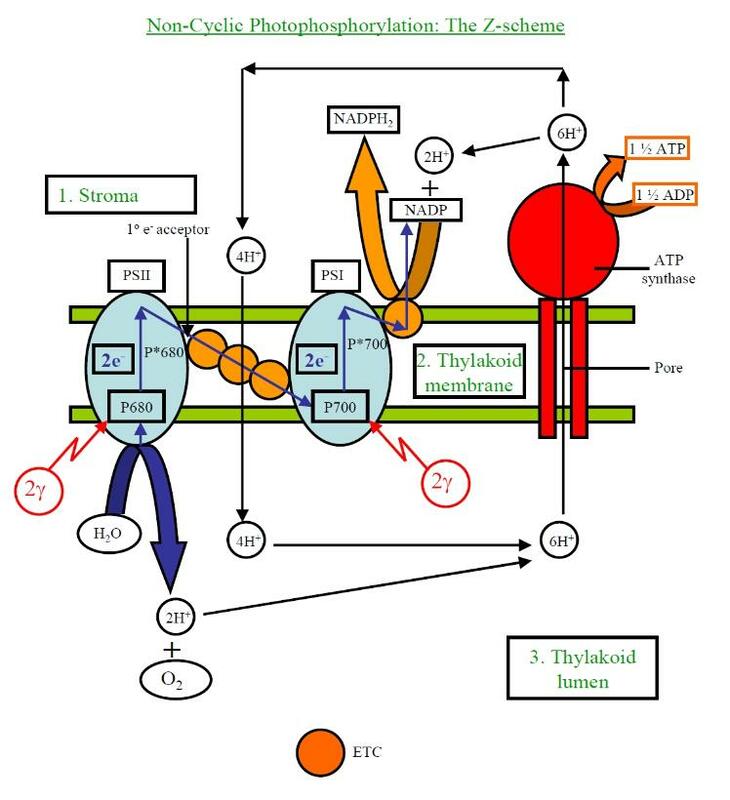 harvested to make ATP in the same manner as in respiration in mitochondria. 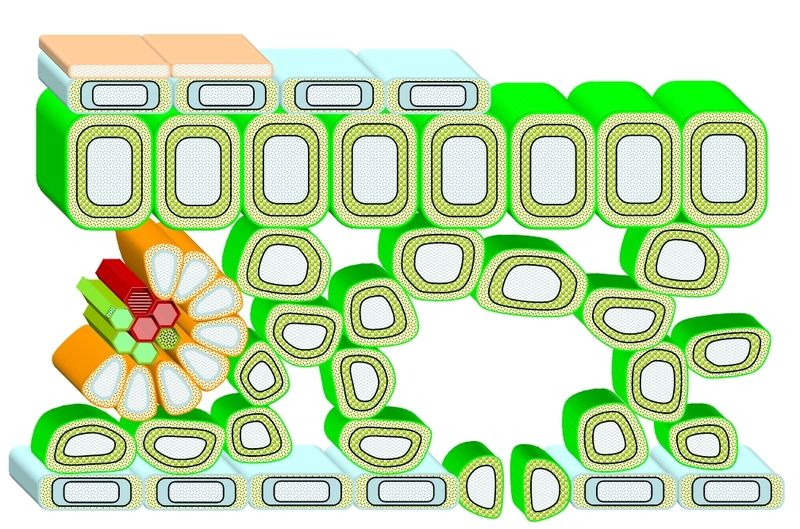 molecules in the thylakoid membrane of the chloroplast. Q. What happens to the NADPH (NADPH + H+ or NADPH2) synthesised in non-cyclic photophosphorylation? important on Earth, second only to the reactions of respiration. various functional groups (chemical groups containing more reactive elements such as O, S, P, N and halogens) added. hydrogen to form glutaraldehyde phosphate (GALP). starch) amino acids and other organic building blocks as needed. product of carbon-fixation is a 3 carbon compound) fix 99% of their carbon during the daytime. and sorghum) have a different mechanism which is more efficient in high light intensities and at high temperatures. 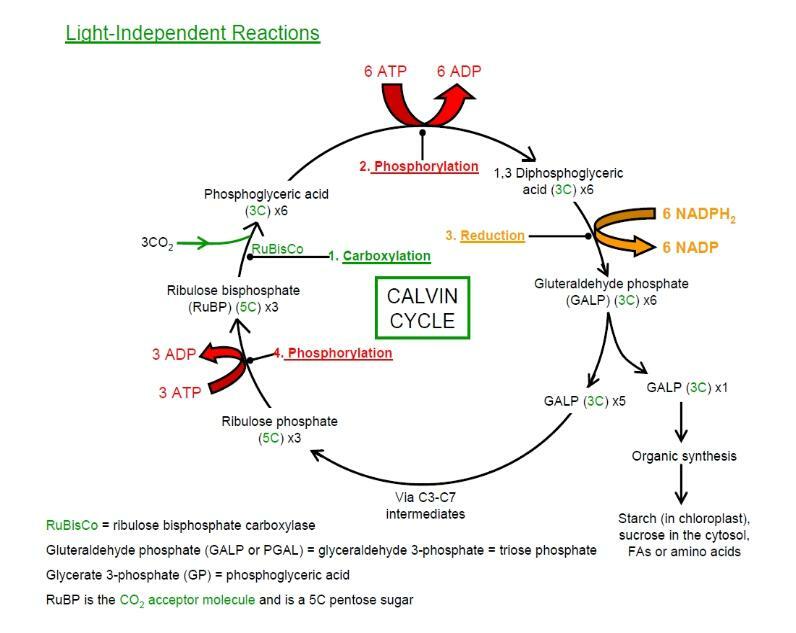 release its carbon into the calvin Cycle. leaves, which are also important. stiffness. In parenchyma, we have water instead of air and the cellulose cell walls form the tiny struts and columns. sclerenchyma as taught cords or cables under tension. (This is reminiscent of the construction of an aircraft wing). remarkably tough for such thin and light structures. palm (Corypha umbellata) produces the World's largest leaves and these are corrugated. 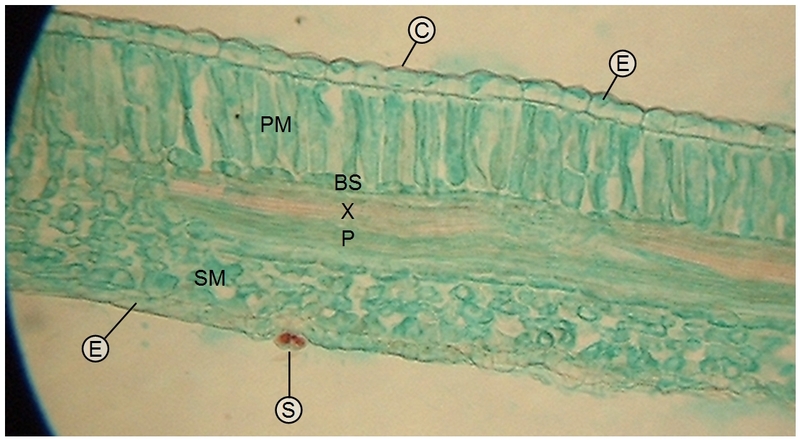 epidermis to the vascular bundle, such as in the common grapevine (Karabourniotis et al., 2000). different natural frequencies, which collectively damps the system and dissipates kinetic energy more quickly. water loss. A leaf has to strike a balance between cooling and water-conservation. overheat in full sunlight. (Something to consider when pruning plants!). keeping the dry weight of the leaf more-or-less constant. tend to be approximately vertical, this angle changes down the stem and the basal leaves are often almost horizontal. compensation point and is the lowest level of illumination at which the leaf breaks even. have flat leaves to intercept more of the dimmer light that passes through the grass layer. and so maximise survival, that makes living things so remarkable! midrib of a privet leaf (Ligustrum). resist tearing, as will the toughened vascular edge characteristic of many leaves. species and even varieties or subspecies. They may be extensions of single epidermal cells, or consist of several cells. umbrella-like or scale-like structures on stalks, and some are branches and tree-like in shape, others star-shaped. 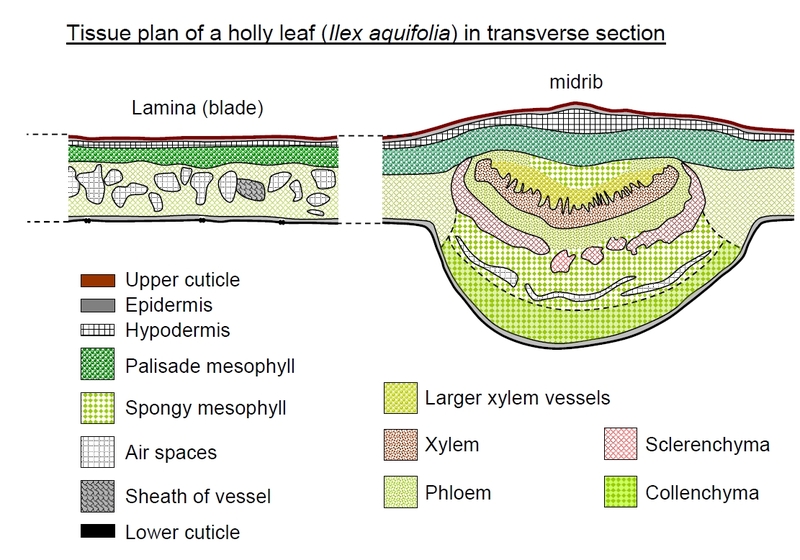 the undersurface (where the stomata are located and where water-loss will be greatest). across the surface of the leaf. Sometimes the hairs can be so dense as to appear cobweb-like (arachnose hairs). http://www.s231645534.websitehome.co.uk/elm_hairs_pictures.htm for an excellent description). 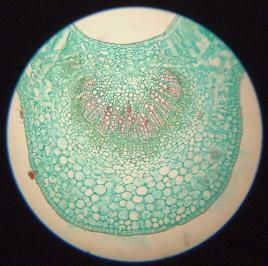 damage tissues by drawing the water out from cells by osmosis). trichomes/glands. The enzyme-secreting glands also serve to absorb the digested materials in this case. materials that protects buds from insects in many woody plants. the heterobaric leaves of Vitis vinifera and Quercus coccifera. Plant, Cell and Environment 23: 423-430.